On Monday afternoon, Fox’s On the Record host Greta Van Susteren went after her own colleague Erick Erickson, lamenting his “pattern of being disrespectful to women” by citing several recent comments made about Texan gubernatorial candidate Wendy Davis. “What is wrong with this guy? He is such a jerk! 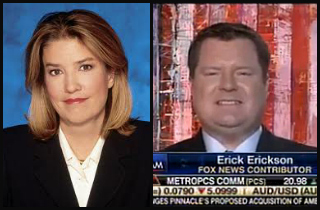 He is a repeat offender!” Van Susteren headlined a blog post calling out Erickson. Her basic case: The conservative pundit makes himself look really bad by coming off as a “jerk” who is “boorish and obnoxious” when expressing political disagreement with female politicians. Wendy Davis is upset you want the truth and she can't handle it. She's so cute when she's lying. Oh, also, just as an FYI: Mediaite readers voted Erick Erickson the worst conservative commentator of 2013. Well, Abortion Barbie does have a vocal fan club. Might be larger except for the open season on anyone under 40 weeks.